KSRTC launches the 'Mercedes-Benz' Bangalore-Mysore bus. Bangalore: The Karnataka State Road Transport Corporation (KSRTC) on Monday received a specially designed air-conditioned Mercedes-Benz bus. It’s a first for a state transportation unit in the country. 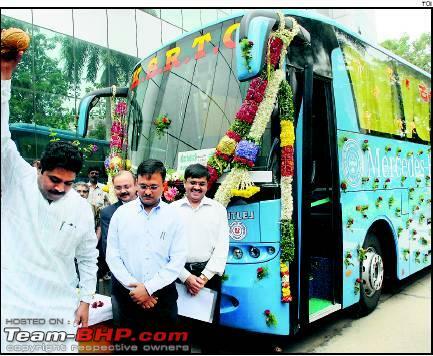 Transport minister R Ashoka launched the bus, which will ply between Bangalore and Mysore for three months. The free trial operation is likely to be extended on an inter-state schedule from Bangalore to Chennai and Mumbai. Drivers for the bus were specially trained at a centre in Pune. Ashoka said depending on the performance, the corporation will decide how many buses can be bought. Each bus costs Rs 65 lakh. The corporation also plans to give light snacks on board the hi-tech bus. The Mercedes-Benz bus will have full air suspension, ergonomically designed executive passenger seats, twin-LCD screens, four emergency exits and other international standard features. Ashoka said rural areas will not be neglected and bus replacement will continue. Refuting a charge that rural areas were not being given importance, he said of the corporation’s 20,000 buses, only 5,000 ply in the urban sector. The state transport sector has received a grant of Rs 16 crore from the Centre. This apart, bus depots will be upgraded for Rs 100 crore. The government is also planning to buy 2,250 buses for the KSRTC and 1,000 for BMTC. A report on the efficiency of old buses and discrepancies at driving schools has been submitted and action will be taken soon. That's indeed a good move by the government. Eager to see the bus. Any more pics of the interiors? Same news with some more pics is there in the Commercial Vehicles thread. A good move by KSRTC, no doubt. Those Mercedes buses look pretty ordinary,there are selling on the name. These guys are sitting on a massive pile of cash. KSRTC's (including BMTC) daily earnings is Rs 7.2 crores. Nice to see a PTC that's professionally managed and making money. Must using the Lallu style of management. Last edited by Mpower : 24th June 2009 at 02:23.
have you traveled in one? This is good news. Im just wondering if Mercedes benz bus is 65 lakhs, whats the price of volvo buses. Also , Is anyone aware of the timings of this Bus. I want to travel this weekend to mysore. I guess like volvo buses in KSRTC, These buses will also have maximum speed limit of 110 kph. Wow, thats good to know, because here in north india, most state run transport corporation report huge annual losses. these guys can learn a lot from their counterparts down south. MSRTC (Maharashtra State Road Transport Corporation) is first ever government organisation in India to launch Mercedes-Benz buses in public road transport. From 1st May (Maharashtra Day), these buses are plying between Mumbai & Pune. Am sure its a matter of time, these buses will be competing with the Volvos on the major routes. May be, I shall try it out on my next trip (if I am doing it all alone). Wow! Thats a lot of money. How do these guys manage it? I am sure even BEST in mumbai cannot make that much money in a day. +1. However, when we'll get the buses with "decent" chemical toilets in them. It becomes a little embarrasing if you need to "pee" in the midst of nowhere and have to ask the driver to stop it for you to relieve yourself. Last edited by amtak : 24th June 2009 at 11:24. These days volvo buses are so crowded that people cant even step inside during peak hours. Earlier they used to be empty. Am sure Merc buses will do well considering the way volvos have done. I wonder what happened to Marco polo buses. Anyone travelled in them? I had a chance to travel by Mercedes-Benz bus from Rajkot to Ahmedabad (Patel Travels) a month before and I felt that it is more noisier than the Volvos (for the no of times I have travelled in the front seat doing Bangalore-Pune and back). Unlike the Volvo which comes with a standard CRT TV, this one had 2 TFT Screens to cater to the whole bus mounted on the roof (One in the front and the other one almost in the center of the walkway). Personally, for that extra lakhs spent on the Volvo, I feel they are better than the Mercs.